I know Hollywood tries to make you believe that, after three minutes of fake contractions and pushing and crying and screaming and happiness, nothing else happens, but I'm here to tell you differently. Everyone shares the labour part of birth, but very few actually tell you what happens after giving birth. After my little boy was out in the world, there was still so much to do. My husband and mom immediately began calling family and friends to share the exciting news, and the nurses had to weight and measure the baby. My doctor was busy delivering the after-birth, and then she and an obstetrician began sewing me up -- I had a third degree tear, meaning that I tore down to the muscle...graphic, I know. 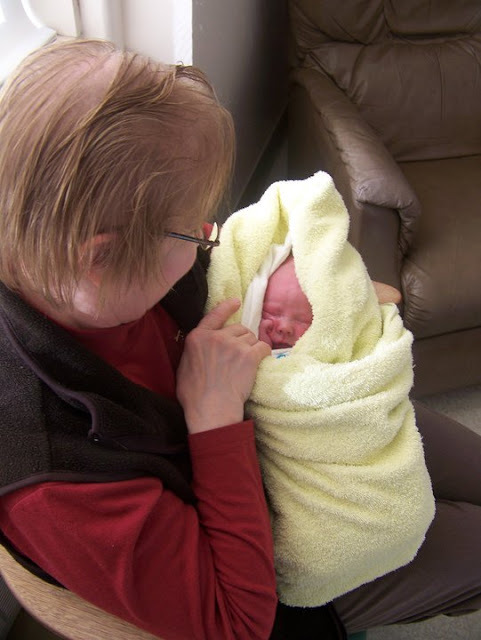 My mom with my little boy -- her new grandson. 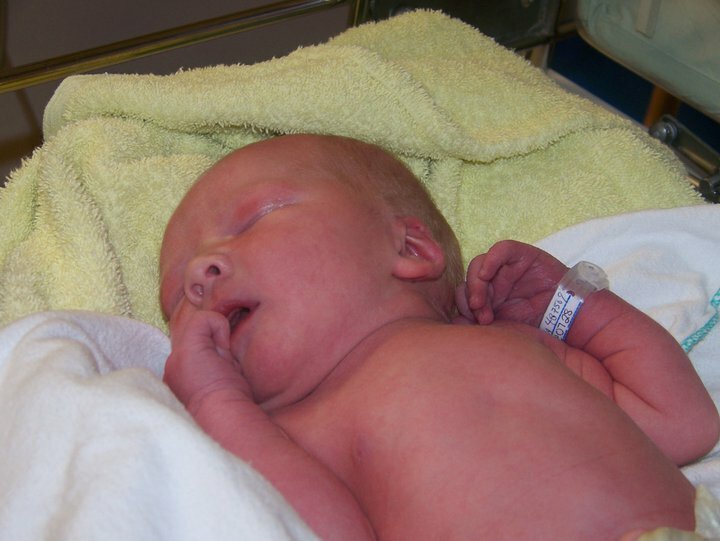 Once everything was settled, the nurses gave me some toast and juice, and unhooked my epidural. It was then that I was sent to the bathroom for a shower. The hot water felt sooo good! I sat there for what felt like forever, and then proceeded to dry off and get dressed. "How are you doing in there?" shouted one of the nurses. "I'm alright. I feel a little dizzy." I said. "It's probably pretty hot in there. I'll come in an open a window." I'm lucky that she did, because as soon as she came into the bathroom, I colapsed and she caught me. I would have hit my head on the toilet. Who knows what the rest of the day would have been like. The nurses got me settled into a wheelchair, and gave me some more juice because my blood pressure was so low. My little boy was given to me, and we were wheeled down the hallways of the hospital to the post-natal department -- they were looking for a new name for that department...I don't know if they found one. I was put in a room with five other mothers and their babies. My husband and I had to stay at the hospital for two days to be monitored, so we decided to book the luxury suite. We just had to wait until it was ready for us to use. I spent much of the morning with the other mothers that were all hiding behind their curtains. Our stay at the hospital would have been much different, and probably unbearable, if we had stayed in that room. Wrapping up my little boy after his first bath. It was there that I was given a poopsicle -- a special frozen pad for my nether-region -- and a special spray bottle to spray my nether-region after going to the bathroom -- this is required for a couple of weeks after giving birth because your body is trying to heal and you don't just want to wipe...trust me. It was also in that room that I gave my son his first bath. It did not go well. The nurse did a lot of the work, but I did what I could. I tried to get as much rest as I could, but people kept coming into the room to check things, and I couldn't relax with all of the other moms and babies around us. Nurses would come in to check my IV or the baby, and a lactation consultant came in to try and help me with the breastfeeding process. I knew that was what I wanted to do, but the whole time it felt like she was being quite rough with me and my child, and I did not enjoy the experience one bit -- I shared my first experiences with nursing here. Once we got into our private room, things became a little more comfortable, and we started getting visitors. A lot of people didn't believe that we had had our baby, and actually thought that it was a very elaborate April Fool's joke. It wasn't. This day was unlike any other, and it was such a big adjustment, but if I were to have to do it all over again, I would gladly do it -- in a heart beat! I love my little boy, and I love what he has brought to our family. It is incredibly hard to believe that a year has gone by, and that he is a year older, because it feels like he has been with us forever. Read Part 1 of the Birth Story here. It's great that people share their birth stories - I wish I had discovered the whole blogosphere when I was pregnant - I really would have helped to read real women's birth experiences - so so so much better than a text book! You are so right that it's much better than a textbook! I learned a lot from the women that I work with that had recently been pregnant.